I didn’t make the baked ziti — it was out of this world! — but there was a lot, and it had a hint of “chicken casserole” in it, if you know what I mean. The side dish this year was garlic mashed potatoes, and I cooked my own specialty in the picture above: Cayenne pepper chicken, spicy and delicious! Having been to Santa Fe, New Mexico, I know how to give it just the right flair. Yes, you could use a barbecue marinade. Hey, even a mesquite. But why use a mesquite when you don’t have to? The recipe is very simple, and after you burn your mouth eating it — have a lot of water handy — you’ll still be glad you broiled it because of that flavor. Here is what you will need, and this is good if you’re cooking for the whole family and want leftovers. As for ovens, your typical gas range is fine. -Two big oven pans/trays for broiling. Layer them with aluminum foil. -32 to 40 Perdue Oven Roaster drumsticks AND thighs. -Defrost chicken well, then lightly salt (garlic works, too). -Two hours later use cayenne pepper seasoning on pans/trays. -Dip bottom of chicken in cayenne pepper seasoning, then spread it across the top layers heavily. You want spice! -Put the thigh/drumstick tray (or pans) in oven. Make sure the top of chicken looks nice and reddish-orange. -Preheat oven to 425 or 450 degrees, cook for 45 to 50 minutes. -Check on it while it’s cooking. 45 to 50 minutes is well done. And these would be from my own personal collection… A few of what’s left, anyway. I’ve collected Star Wars for 30 years now. Yup, since I was a toddler. On the left is a talking Darth Vader stuffie, the Empire Strikes Back action figure Bossk the Bounty Hunter (behind him is another packaged figure; Han Solo in Hoth Gear). Next to that you have the Hammerhead figure, Roron Corobb (The Clone Wars cartoon). Behind Roron Corobb, there’s Luke Skywalker, dressed in ceremonial garb from the ending of A New Hope (when he received the medal for destroying the Death Star). Over on the right, yes, that would be the original 1983 Rancor Monster and Darth Vader Action Figure Holding Case. Inside are TONS of figures made between the years 1977 and 2007. Last but not least, the blue phone box in the center is Doctor Who’s time machine, the TARDIS. It blinks, it flashes, it makes sounds, and David Tennant’s voice emits from it. It also doubles for a coin bank. I used to have a couple of Dapol ‘Who’ figures and a Tom Baker doll back in the day, too. All this and more will be handed down to my boy when he gets a little older. Unless he wants to trade his 2008 Hess truck, mind you. Oh snap! Santa was here! Decisions, decisions. Which shoud I open first? Animal Planet Remote Control Tarantula - I loved this! Other gifts for the 2008 holiday included a Curious George Doll and children’s book set, a few Berenstain Bears children’s books, a plush recliner for toddlers from Land of Nod, a Remote Control Spider (which I think I already posted), a Little Tykes Piggie flashlight, and for me, books yet to be read. There were some small NERF balls, too. However, the Pillsbury Doughboy is not new. Very old school. At the end of the day it’s time to finish off the season right… Watching the Doctor Who Christmas Special via BBC satellite, like every year, or on a Web forum tonight. David Tennant and David Morrissey in the long-awaited episode: THE NEXT DOCTOR. 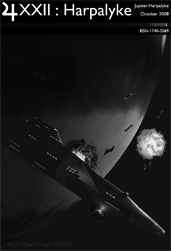 The issue is a bit late, but my story DEPARTURE FLIGHT is currently up at The Written Word Magazine, Issue No. #15. 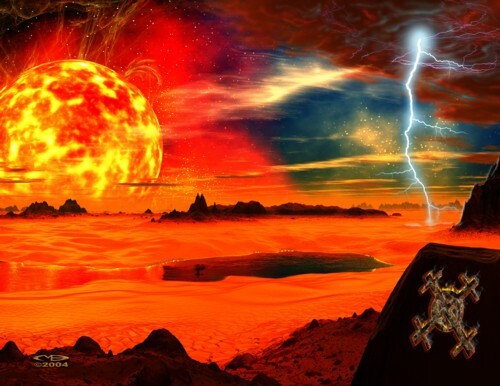 The Web-based publication is also connected with Rebel Dawn Creative Force and Masterpiece Comics. Featuring work by: William Markly O’Neal, C.A. Ellis, Kate Smith, Christopher Hivner, Billy Wong, Lawrence Dagstine, Dudgeon, Byron D. Howell, Roger Haller, and Morgen Kirby. Edited by Ace Masters and Barb McCaffrey. 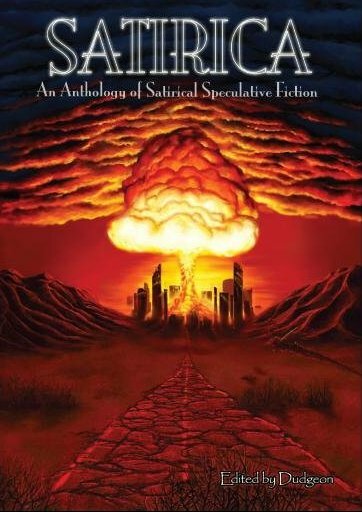 The most promising-filled anthology of science fiction is now available from Cowboy Logic Press, and it’s slowly creeping up in bookstores. With over 110,000 words and 24 stories set in futuristic societies, post-apocalyptic dystopias, and more! Featuring pro authors such as Steven J. Dines and David Thorpe (Harper Collins Children’s Books). It’s also available on Amazon. Other promotion efforts include the Midwest, Canada (British Columbia & Winnipeg), Great Britain, and NYC locals Jason K. Chapman and Myself. But Bill, nobody’s done a better job so far than you. Thank you! Bill Housley is the author of the very topical piece, “Another Man’s Terrorist”. A science fiction writer, he can often be found at Jim Baen’s place (the JBU slush). 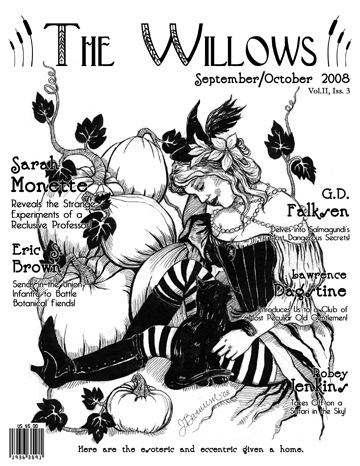 Just a follow-up/reminder post that THE WILLOWS MAGAZINE Fall Issue (September-October) is now on sale. Featuring Lovecraftian-styled tales of terror, Neo and Post-Victorian stories, enchanting tales of dark fantasy, steampunk culture, and other weird fiction delights. Get your copy TODAY! I’ll add SF Crowsnest to Author Resources. Other than that, over the past three weeks I’ve nabbed another six story acceptances for various publications throughout 2009.